This is a truly magnificent piece, the elegance of it is is a hard find in today's world. 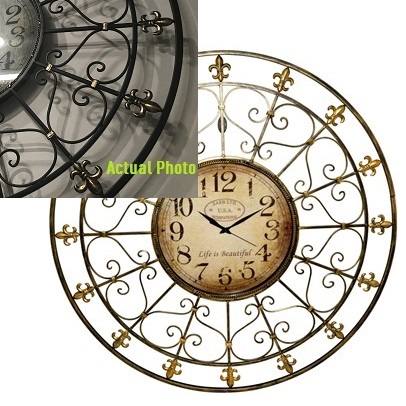 With painted gold color Fleur-de-Lis on the outside circle, the inner circle, which surrounds the clock frame, has a beautiful and "soothing to the eye" bronzed wrought iron design. A fun choice for your Cinderella Prom theme and large enough that everyone can see it. Rent for your special event, or purchase for your home. Only 3 left!